Happy February everyone! Well here we are in the second month of the year, and hopefully your New Year’s resolutions are still going strong. I really didn’t make any this year, but I am always on the hunt for healthy and delicious food options. Enter Trader Joe’s, or as I like to call it “my happy place,” second only to Target. I love shopping at Trader Joe’s because I always discover something new and fun in the store. Today I wanted to share with you my must haves when shopping at Trader Joe’s. These items are always on my shopping list! I also included a delicious recipe full of Trader Joe’s ingredients that my family loves. 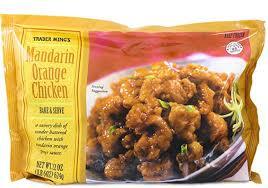 Mandarin Orange Chicken: This is a meal staple in my house. Everyone loves it, and I mean everyone! It’s great for when I have absolutely no time to make dinner. Serve with their Vegetable Fried Rice and Edamame, and dinner is done! 2. Honey Mango Moisturizing Shave Cream: You guys! This stuff is awesome, and it smells so good too. I use this to shave and it always leaves my legs smooth and soft. Put this on your shopping list and thank me later. 3. Everything but the Bagel Sesame Seasoning Blend: This is a fairly new obsession of mine. I put it on everything, including those God awful GG crackers. It’s also awesome on eggs, popcorn, and as a vegetable seasoning. 4. Frozen Crushed Garlic: Heaven forbid I run out of this because I use it all the time. I have often found that this is out of stock at my Trader Joe’s, so when it is there, I stock up. My sweet Aunt Denise introduced me to these and I truly cannot live without them. 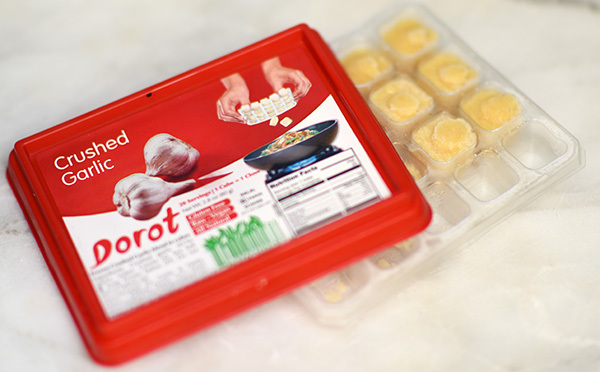 They beat all other prepared garlic hands down as far as convenience and taste go. 5. 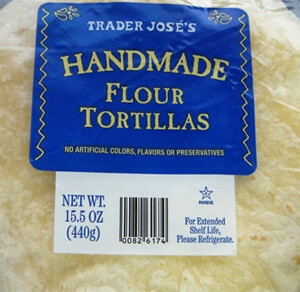 Handmade Flour Tortillas: Okay these are not the healthiest things on the planet, but I am obsessed with how they taste! I have to hide them from my oldest son because he will take the whole bag just to snack on. They are an absolute must for the recipe below. 6. 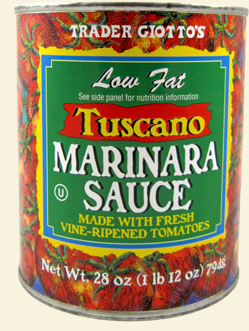 Tuscano Marinara Sauce: I have introduced this sauce to everyone I know and they all love it. I keep so many cans of this on hand because my family loves pasta. This tastes so fresh despite being in a can, and it’s especially delicious in Chicken Parmesan. 7. 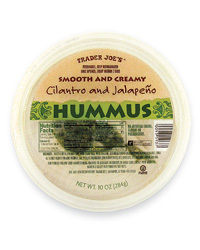 Cilantro and Jalapeno Hummus: So pretty much all of Trader Joe’s Hummus options are delicious, but this one is my favorite. I love it with raw veggies and their pita chips. 8. 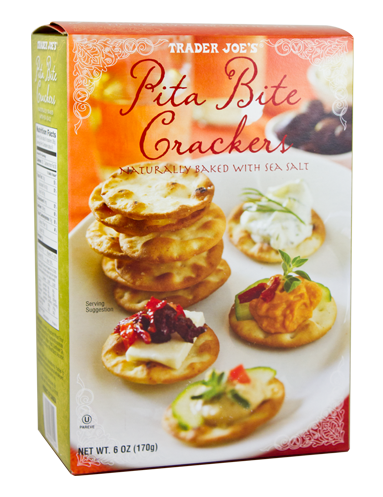 Pita Bite Crackers: I grab these and keep them on hand to go with all of Trader Joe’s amazing cheeses and meats. They are a staple for a pretty Charcuterie tray. 9. 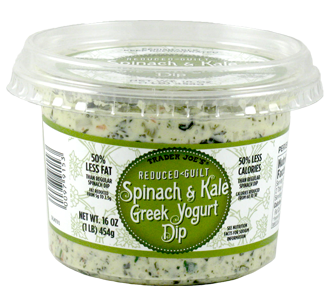 Reduced Guilt Spinach & Kale Greek Yogurt Dip: A long time favorite, and probably one of the first items that I fell in love with. It’s a great alternative to all those heavy game day dips. Bring it to your next Superbowl party and watch it disappear. 10. Wine: Obvi. Be on the look out for small batches that run out. My recent favorite was The Big Churn. I also love Hacienda Chardonnay and a table red called Grifone. Most people love the Two Buck Chuck, but I just don’t like it. There I said it. These are probably my top ten purchases at Trader Joe’s, but there are many other products that I would recommend, including their nuts and produce because of their value. Also, don’t forget to shop their seasonal products. I love browsing Trader Joe’s in the fall because they carry pumpkin spice everything! I am also obsessed with the Candy Cane Joe Joe’s at Christmas time. Thank you to my dear friend Elizabeth for introducing those to me. Now on the recipe that I promised. This is a hearty and delicious recipe that my family loves during the winter. Pick up all the ingredients the next time you hit up Trader Joe’s along with all of the products I listed above. Enjoy! Pick up all of these ingredients on your next Trader Joe's run, and enjoy this hearty and delicious soup. In a large saucepan, combine the beans, pork, salsa verde, and beer. Cook over medium heat for ten minutes, breaking up the pork carnitas as it warms. Serve warm with Trader Joe's handmade tortilla shells, cilantro and sour cream and lime juice. I have also added a can of Trader Joe's refried black beans to thicken it up, and it is delicious. The Reduced Guilt Spinach & Kale Dip and the Guacamole are two of my favorites. I could literally eat the entire container haha! 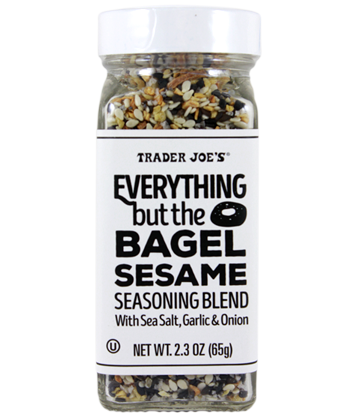 I have heard people rave about the Everything But the Bagel Sesame Seasoning. I will have to check it out next time I’m there! Have a great weekend, girls! I have to try this shaving cream, I love trader joe’s. I might have to try the shaving cream. If you can believe it the nearest Trader Joe’s is over an hour from where I live. Mmmmmmmm…this recipe looks delish! I’m pinning this, I don’t get to TJ’s much because it’s not close and then when I do I don’t know what to get! You just fixed my problem! The spinach and kale greek yogurt dip sounds like a winner! TJ’s is such a jam! Reminds me- I need to make a trip! 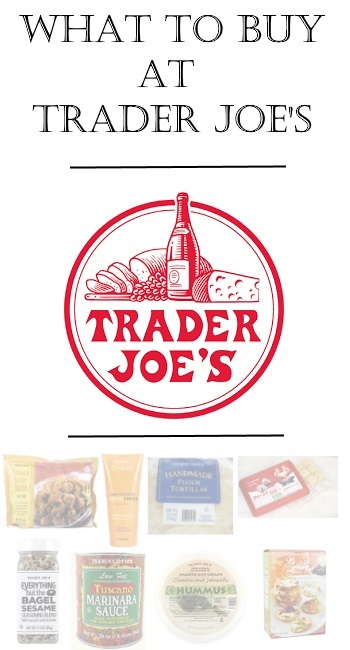 Can you believe I’ve never shopped at Trader Joe’s… ha?! 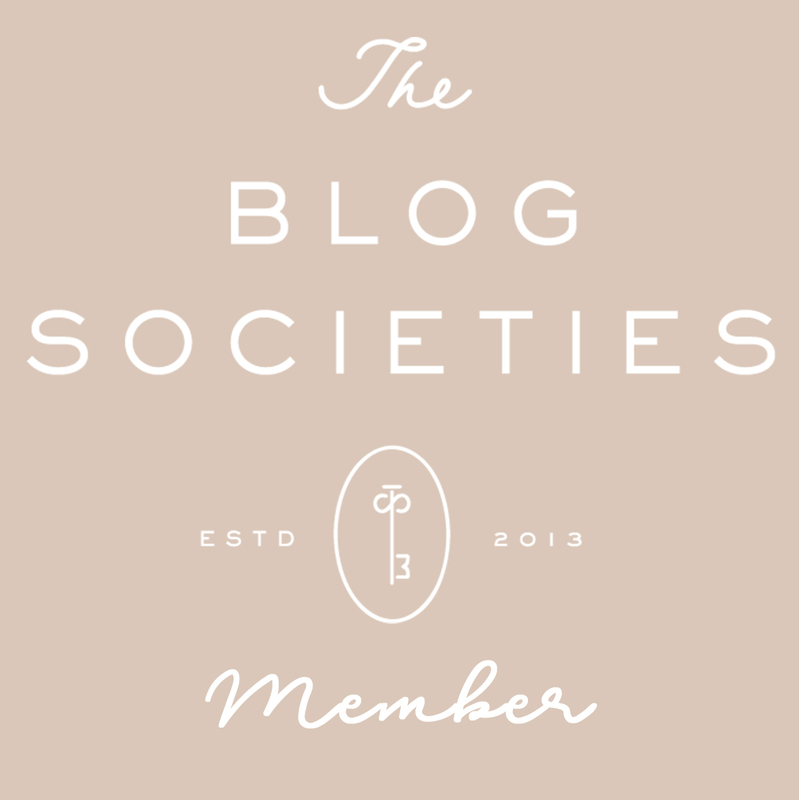 I always hear such good things- Maybe this is the year to check it out! I’d love to try Honey Mango Moisturizing Shave Cream myself! Thanks for sharing dear!